Why Glycans? | GlyTech, Inc.
Home > Hello Glycan > Why Glycans? The sugar chains known as glycans are found throughout the human body. They are attached to the surface of our cells, many proteins, antibodies, and also to some viruses and bacteria. They play vital roles in a huge variety of biological processes, particularly those related to cell communication and identification, and so have been called the “third chain of life” after nucleotides (RNA/DNA) and peptides (proteins). 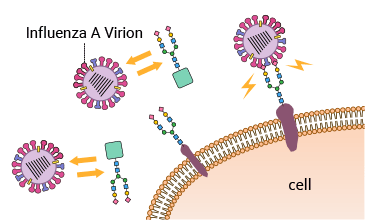 Disrupting the ability of bacteria and viruses to bind with specific glycans on the cell surface could be used to prevent and treat infections like influenza that target certain tissues and organs. Artificial and non-human derived biopharmaceuticals without glycans are sometimes rejected by the body as foreign. 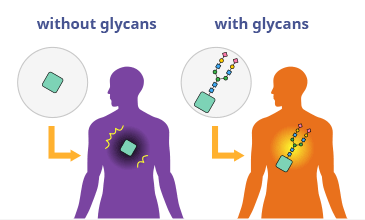 Attaching human-type glycans (“glycosylation”) may give stealth effects and cause low antigenicity. 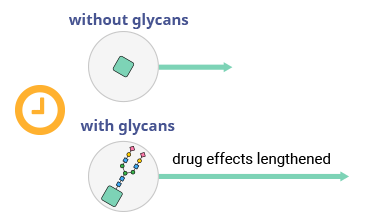 Because sterically bulky glycans cause protease-resistance and decreased renal clearance, appropriate glycan addition can lengthen the effects of a drug. 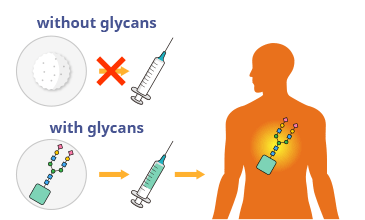 Appropriate glycan selection could direct the body to deliver drugs to certain organs or cancer cells, increasing their efficacy and decreasing their side effects. 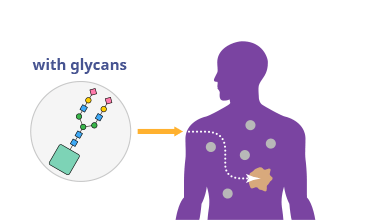 Adding glycans to drugs can increase their solubility in water, making them easier to handle and administer to patients and improve their absorption. A number of glycosylated biopharmaceuticals are already available on the market. Advancing our understanding and use of glycans will also advance our knowledge of disease and how it may be treated.